Years ago, while navigating some health issues of her own, Theresa Morin realized the deep connection between quality of life and our emotional and spiritual health. She became extensively trained in every intuitive practice of healing work that she could find. As her own health improved, and as she discovered the benefits of Theta Healing, and crystal healing, she felt empowered to help others too. 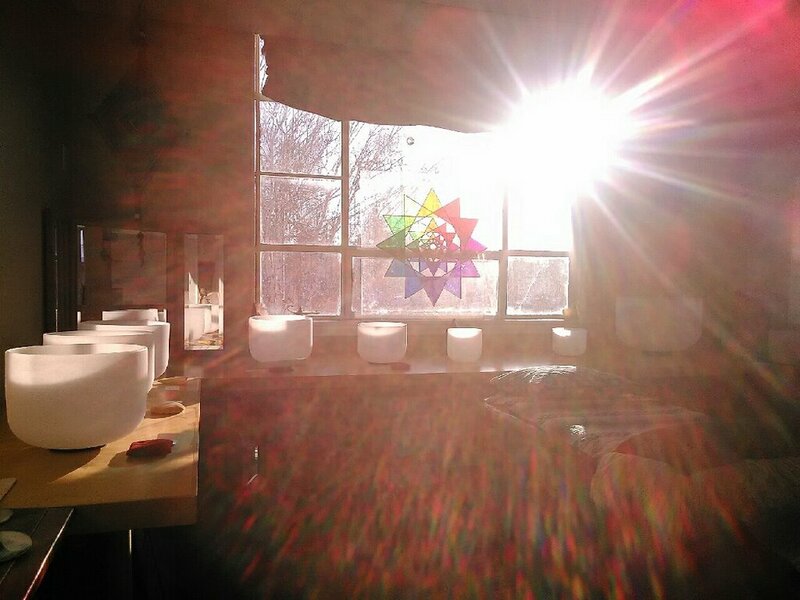 Today, in her studio in the lovely mountain town of Heber City, Utah, just outside Park City, she puts her healing crystals, stone table, singing bowls, and intuitive training to work. Her clients span all ages and come from all walks of life, with a variety of challenges ranging from chronic illness to fatigue, stress, pain, difficulty moving on, and even trouble focusing. By bringing her clients into energetic alignment, Theresa opens up their full intuitive and healing power. You'll leave feeling empowered, more centered, stable, energized, and nurtured. Healing services to calm the mind and strengthen the soul. When you come in, Theresa will sit down and discuss how you're feeling and what kind of help you need at the moment. For instance, are you dealing with a physical ailment, stress, anxiety, trouble focusing, or depression? 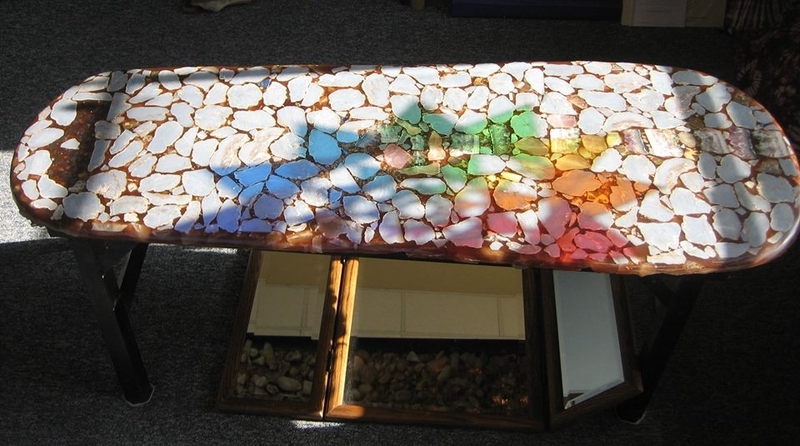 You can then lie down and stretch out on Theresa's beautiful Angelite crystal table and relax. Together, she'll go over your chakras, one by one, finding and correcting any energetic imbalances. She may also immerse you in a vibrational sound bath with her crystal singing bowls, which play perfect and true tones to encourage your own body's vibrations to come into alignment. At the end, you'll feel balanced, restored, whole, and re-energized. If you're new to this type of healing work, you may be wondering what chakras are. Essentially, according to ancient wisdom, there are points in our body that serve as energetic centers. Our bodies are abuzz with energy and motion, and our energy and life force need to be able to flow easily for us to remain healthy--both in mind and in body. When something within us is unwell, whether it's a physical organ or an emotional injury, we have a corresponding chakra that is compromised. By addressing it, we can promote healing in specific parts of your body and in your emotional life. You can read more about chakras here, as well as in a number of books and online articles. Theresa is pleased to be teaching a Crystal Therapy Class on February 5th from 6-9pm at the Utah Valley University Wasatch Campus here in Heber. This three-hour class includes the crystals you'll need, and you'll learn gentle, non-invasive processes to bring balance to the body. It's fun, enlightening, and has day-to-day applications as we find healing physically, spiritually, and emotionally. The cost of the class is $65, and you can sign up online at the link below! If you need healing or help getting centered but you don't have room in your schedule or budget for a longer session, this will get you tuned up and ready to go! Theresa will go through your chakras, one by one, finding imbalances and bringing them into alignment. You'll leave feeling stronger, healthier, and ready to take the world on. This session includes a chakra tune-up as well as a full healing involving whatever your body and spirit need most at the moment. Theresa will employ the full culmination of all her training in different healing modalities to benefit both body and spirit. Relax and let your body come back into alignment and recharge. You'll be better prepared for life's challenges. Experience the power of a group meditation or singing bowl rejuvenation. This is perfect for yoga studios, retreats, team-building, families, and fellow healers to gather and reboot their spirits and senses. Your event can be held in your own space, or Theresa can arrange something truly special, such as booking the Homestead Crater, where singing bowls have amplified magic in the crater's grotto. Exquisite, top-quality singing bowls are also available for purchase through Theresa. She can walk you through the selection process and show you how to play one yourself. Each bowl plays its own note of the musical scale, and each specific note harmonizes with one of your main chakras to bring it into perfect alignment. You can select a bowl or bowls in line with your own healing needs, to play at home or in a studio of your own! Just reach out to Theresa for details on the bowls and their pricing. Theresa can consult with you to discuss your specific emotional, spiritual, and physical health needs, as well as the impact of your lifestyle. Give her a call or send an email to set up your first session. Come as you are, and leave feeling better.